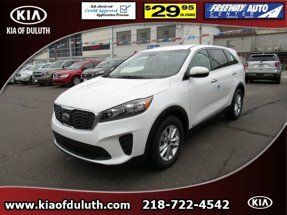 Description This 2019 Kia Sorento LX AWD is a real winner with features like a backup camera, blind spot sensors, Bluetooth, braking assist, hill start assist, stability control, traction control, anti-lock brakes, dual airbags, and side air bag system. This one's on the market for $32,995. This SUV AWD is one of the safest you could buy. It earned a crash test rating of 5 out of 5 stars. The exterior is a timeless snow white pearl. This is the vehicle for you! Give us a call today and don't let it slip away!